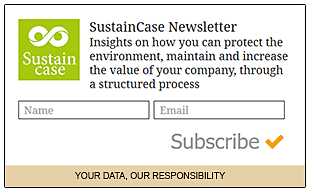 Newsletter- SustainCase- CSR Magazine: Subscribe Now! The case studies sent out monthly through the FBRH Sustain Case Newsletter are intended to give you insights on how you can maintain and increase the value of your company, through a structured process. Today, 80% of the world’s 250 largest companies are using the Global Reporting Initiative’s Standards for sustainability reporting. They are dealing with their most important impacts responsibly by identifying, measuring, setting targets and taking action. Most importantly, companies are using the GRI Standards to improve their reputation and build trust and respect, by documenting their positive contribution to the world and communicating their sustainability performance through their reports. Τhe FBRH Sustain Case Newsletter is sent out montly. With each case study in this series the FBRH team highlights one key impact identified by a company reporting in accordance with the GRI Standards, showing how it took a structured, systematic approach to improving performance. These case studies illustrate how and why a company had to take action on a material issue, how it engaged with its stakeholders to identify material issues and, most importantly, what actions were taken to tackle the issue in question. Stay updated monthly with the latest case studies and gain insights on how you can maintain and increase the value of your company through a structured process and the GRI Standards.